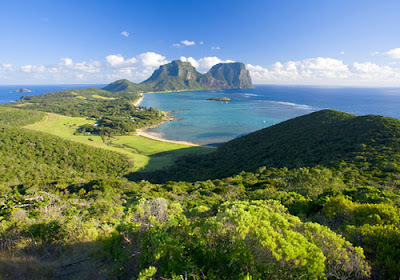 Big brothers ... Mount Gower and its smaller brother Mount Litchbird dominate New South Wales' Lord Howe Island. 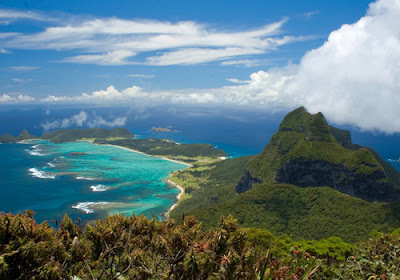 Howe fantastic ... Lord Howe Island is a natural paradise and is just a two-hour flight from Sydney or Brisbane. 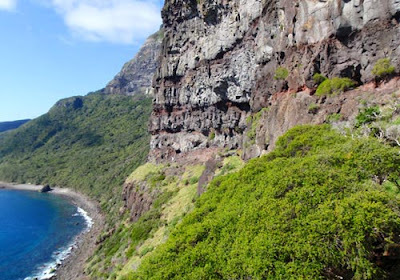 Rocky road ... the 8-10 hour climb to the summit reveals clues to the island's fiery creation and is not for the faint-hearted. 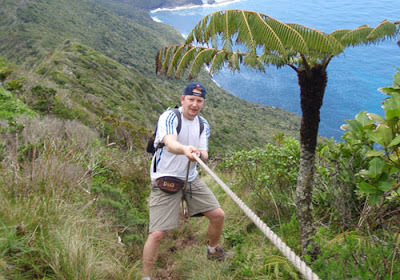 Rope trick ... bolted to the stark cliff face, or attached to trees, lengths of rope are dotted along the trail to help climbers man oeuvre around ledges or pull themselves up steep inclines. 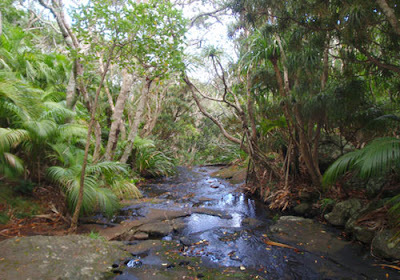 Water retreat ... Erskine Creek is a tranquil outcrop with a freshwater stream flowing from deep within the mountain, over the cliff face and out to sea. 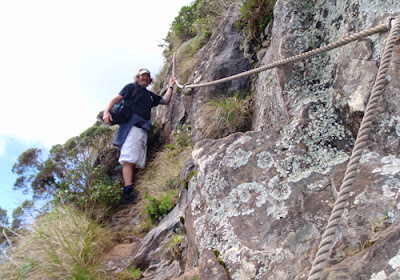 Mountain man ... known throughout the island as "Mister", Malcolm Schik comes from a family of mountain guides. 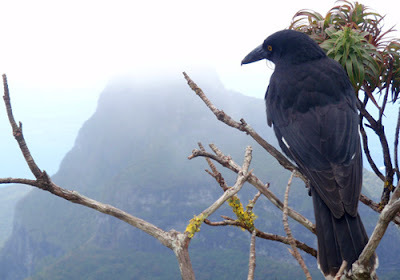 Bird's-eye-view ... petrels follow walkers along the climb in search of any unwanted food scraps and admire the view of Mount Litchbird. 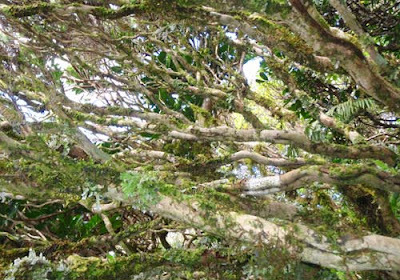 In the frame ... Mount Litchbird (777m) dominates the view from the Saddle, while Mt Eliza, North Bay and Old Settlement Beach are pushed to the background. .
Green scene ... near the summit, palms compete with flimsy ferns while moss covers every trunk, rock and patch of ground. 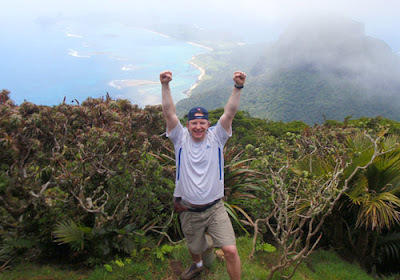 Top of the world ... after 5 ½ hours of battling boulders, grappling ropes and death-defying ledges – Lee Taylor pumps the air of summit. 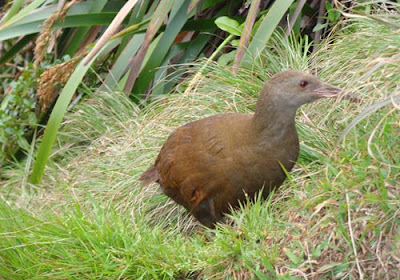 Elusive bird ... the Lord Howe Island woodhen is one of the rarest birds in the world, so you'll have to do the climb to find one. 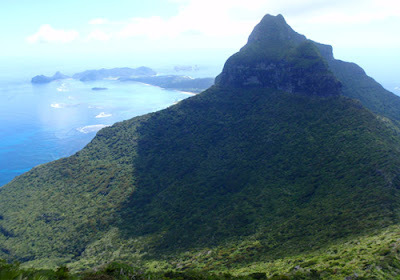 Picture perfect ... the view from the summit of Mount Gower will last forever for those brave enough to take the challenge. 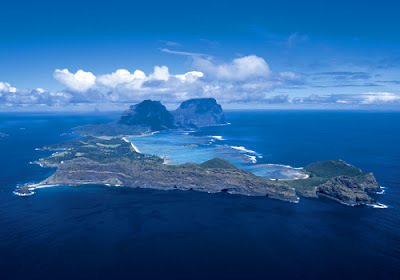 No postcard comes close to the real deal.